The Vineyard Church that was birthed in Muyange seven years ago is pregnant (if that is the correct term) and expecting twins. They are not to be identical twins and will probably not be born on the same day. Let me explain. The first born was conceived when the gospel message was gratefully received by a number of people in the Byumba area, north-east of Kigali, and these people have expressed a desire to be guided on the path to becoming a Vineyard Church in their own right. Antoine, who pastors the Muyange Vineyard, has been mentoring a young man in the community there called Jean Paul for about one year and last September some leaders from the Muyange church were asked to go to Byumba and baptized 27 people in that community. In March of this year the Muyange leadership rented a minivan and packed in a sound system and keyboard as well as 18 people and went to Byumba for a celebration. The folks there erected a tent and hooked up the sound system to a small generator. A time of praise and worship was enjoyed by all followed by a meal prepared by the hosts. After the meal, Bibles were given to all who had been baptized in September. The team arrived home late but very blessed to have shared their love for Jesus with their new brothers and sisters in the Lord. The second to be born is still in a more embryonic form at this time. Jean de Dieu is a young man who went to school with Antoine and is now a teacher in the Kibungo area of south eastern Rwanda. Jean has been spending his school vacation times staying with Antoine and Florence in Kigali and being discipled by Antoine. Since his conversion his neighbors and friends have remarked on the change in his life. Jean would like to be baptized in his own community so he and Antoine have decided to do an outreach from the Muyange church to Kibungo and all who receive Jesus that day will be baptized with Jean and form the new church to be started there. There is a great excitement around the Muyange Vineyard these days as the Lord’s work continues to grow and develop. We still face the hurdle of finishing the building according to the quite demanding codes of the local authorities but we are confident that our prayers will be answered in time and the church in Muyange will be the launching pad for great things in God’s kingdom in the country of Rwanda. Your prayers for Rwanda and its people and God’s work there amongst them are always appreciated. 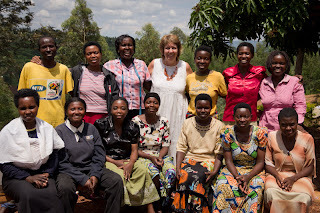 Check out the Vineyard Mission Rwanda Facebook page. With the upcoming Partnership meetings coming up later this month in Kigali we hope to have lots of exciting news to share about what is happening at the Muyange church and around the country. Many blessings to all our partners and supporters. We would like to wish everyone all the best wishes for a healthy and happy 2013. When we extended the roof of the church building in Muyange last year we used timber rather than the more expensive steel of the original structure. A recent rain storm caused considerable damage to the extended part of the roof which needed to be fixed right away. In order to save on material costs, the iron sheets from the store room which was used during construction were taken to replace the damaged sheets. So much for wondering what to do with the storeroom when the building is finally finished! Don’t you just love it when the solution to a problem is right next to it. Here in Nova Scotia we are enjoying unseasonably warm weather and as I sit in our new home in Timberlea with the sun shining through the windows I am reminded of our other home in Kigali. During my weekly Skype meeting with Antoine yesterday he mentioned that they are having an unusual amount of rain which is threatening to damage all their crops. The weather is just so messed up. There was a good report from the Students who are being sponsored in our Secondary School Sponsorship Program. They are all busy doing year-end exams and we look forward to good results in the New Year. Please pray them this week. Every student now has an mentor in the church who is responsible for the spiritual welfare of the student. Florence is in good health as she approaches the sixth month of her second pregnancy. They’ve been told it is a girl and they are both very excited at her expected arrival the first week of March. Please pray for them as the face a number of challenges leading the church. The Story Company who are partnering with our Ibyshimo Sewing Coop have posted this video of the people at work. the prospects for this local business are very good. At the end of our sessions we got together in small groups to pray.